This entry was posted in Home and tagged clutter, declutter, get rid of stuff, home, junk drawers, simplify, storage. Bookmark the permalink. Junk drawers really do sneak up on you! I’ve kept mine organized with little bins and that’s helped keep me sane! I know right? I need to get some little organizers – I’ve been really digging Marie Kondo’s “The Life Changing Magic of Tidying Up” and she emphasizes little dividers, especially for clothing! I’m not sure if they’re still there, but Target had some good ones in The One Spot! 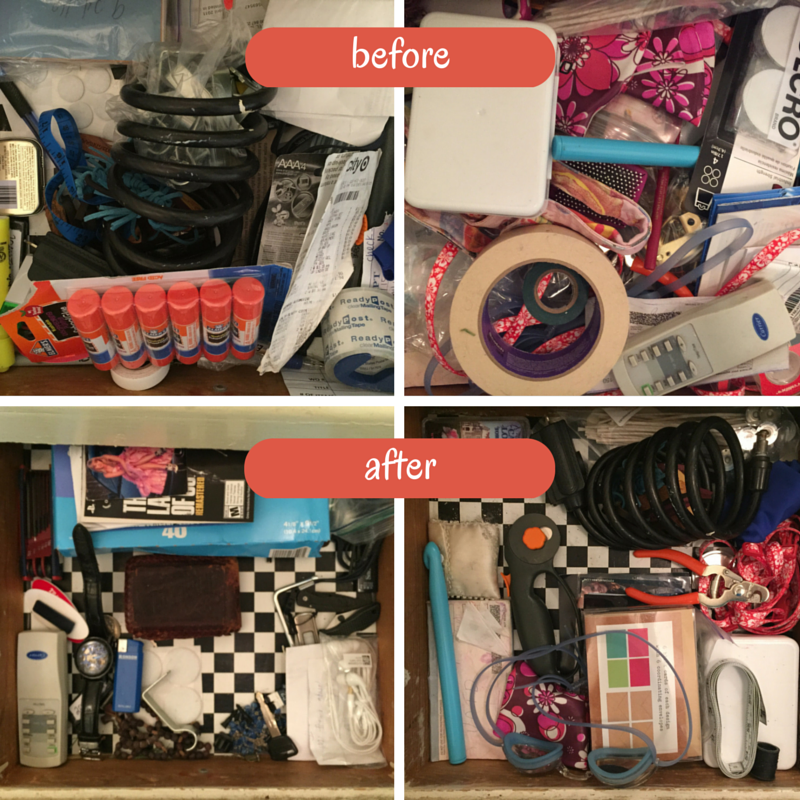 our drawers are doing pretty well – but the larger areas need help – like our basement! It’s underway though so that’s encouraging. I can’t seem to give up pens and pencils that still work – but we have way too many, even with 3 boys in school! That’s great – it’s the big areas that need attention first and all the little things will fall into place! I know the feeling – I had pens for nearly ten years that still worked. Clearly I didn’t need them because I would have used them if I really did need them. But still, it was strangely difficult to finally part with them. Hope the basement is going well, thanks for commenting! My problem is getting my husband on board with getting rid of the contents of our junk drawers. The last time I tried, he panicked and made me put everything back….everything! Wow! Thanks for sharing this!!! I am at work today, clearing out my junk drawers!! I already feel ten pounds lighter!! Loved this! 100% Guilty of this. I kept these weird velcro strips from 5th grade because I knew they would be useful one day when I had a garden (I did finally use them this year..) BUT was it worth moving them oh so many times?! Erm, no. I also have a makeup junk drawer, I call it my graveyard, clearly I should throw it all out. Hah! I am glad to hear you used them though, that’s impressive! It’s absolutely insane the stuff we tote around for “just in case.” I love the name for that drawer, how chilling & appropriate. Again, it’s so crazy what we hold on to – I kept dried out nailpolishes for years because for some reason I thought there might still be a little bit left. I didn’t even like the color. Great post! Thank you! I can’t wait to get home and do some clearing out – out of sight out of mind is a very dangerous habit!